My maternal grandmother was Ethel de Pearsall Clabburn (1879-1960), eldest of the six children of Arthur Edward Clabburn and Rosey de Pearsall. Arthur Clabburn was born in the hamlet of Thorpe, on the outskirts of Norwich, Norfolk, on 7 April 1849, to a prosperous family of local businessmen, manufacturing silk shawls. In his late teens he joined the army, and was commissioned as an Ensign in the 75th (Stirlingshire) Regiment of Foot on 16 Oct 1868, being promoted to Lieutenant on 5 March 1870. He travelled extensively with the regiment, serving in Hong Kong, Singapore, Mauritius and Natal. On 3 Jul 1872 he was placed on the half pay list, retiring from the service on 24 Mar 1875 (just short of his 25th birthday), when he "received the value of his commission". Under an army restructuring a few years later, in 1881, the 75th Regiment became the 1st Battalion of the Gordon Highlanders and some sources refer to Arthur having served in this regiment. Arthur's father's friendship with the artist Frederick Sandys had probably spurred Arthur's own artistic interests, and he spent the remainder of his life trying to make a career as a freelance artist. According to a letter Arthur's daughter Ethel James had published in The Times, Sandys used to take young Arthur to visit his friend Dante Gabriel Rossetti at his house at 16 Cheyne Walk in Chelsea, where other members of the Pre-Raphaelite Brotherhood were often present. Arthur had pictures shown at Royal Academy summer exhibitions in 1875 (No. 1064 "Miss Fanny Jecks"), 1876 (No. 1142 "A Portrait") and 1879 (No. 1397 "Portrait of a Lady"); for the first two of these his address is given as his father's home in Norwich, but in 1879 (by which time he was married) it is shown as 159 High Street, Notting Hill, London. I have been unable to trace a birth record for Rosey de Pearsall (circa 1861 - 17 Jan 1922) who was the daughter of Robert Lucas de Pearsall (the Younger) (son of the composer Robert Lucas Pearsall) and Anna Maria Hamilton-ffinney (a grand-daughter of Rev. Samuel Lee (1783-1852), Professor of Hebrew and Arabic at Cambridge University). It seems likely that Rosey was born out of wedlock, around 1861, with her parents not marrying until 23 Mar 1864. Census returns give inconsistent ages for her (though that of 1881 records that she was born in the Paddington district of London) and her death certificate in 1922 gives her age as 60. Despite coming from "good" families, her parents seem to have been somewhat impoverished, and Rosey's father died in mysterious circumstances (found drowned in a canal in the East End of London, close to where the Olympic Stadium now stands) in December 1865. Her mother remarried within three weeks, but Rosey appears to have been sent off to a small private boarding school in Liverpool, where she is recorded in the 1871 census. Presumably some financial provision was made for her (I have some elegant visiting cards, in the name of "Miss de Pearsall"), though I am unsure if this came from her new stepfather's family, the Carttars (who certainly remained in close touch with her) or from her father's married sisters, the elder of whom was by this stage the Countess of Harrington, married to one of the richest landowners in the country. Arthur and Rosey were married on 25 November 1877 in Southend parish church, Essex, and it appears that they "eloped" there with the disapproval of both families. Rosey's age is given as 18 on the marriage certificate (which would put her birth in 1859), but she was almost certainly younger than this; family tradition is that she was only 17 when her first child, my grandmother Ethel, was born sixteen months later. Their marriage seems to have been a happy one, and they produced six children over a period of sixteen years. Economically, their life was probably rather "hand-to-mouth", with an uncertain income dependent on whether or not Arthur had been paid for any art commissions, probably supplemented by a small army pension. Whether Arthur got much work from clients I don't know. The fate of the three early pictures shown at Royal Academy summer exhibitions in 1875, 1876 and 1879 (mentioned above) is unknown, and an 1877 "Portrait of a Fisherwoman" was sold by a Norwich auctioneers in 2012. The only direct sale of his which I have been able to identify is a picture of the interior of St Mary's Church at Ealing (now at Ealing Central Library in west London), which he sold to the library in 1891. I also hold a photograph (left) of a portrait, identified on the reverse as being of "Bertha Tufnell wife of Colonel Tufnell" [Ellen Bertha Tufnell, née Gubbins (1867-1930), whose husband Edward Tufnell (1848-1909) was MP for Essex South East from 1900 to 1906] which is noted on the front, in the hand of Arthur's daughter Ethel, as being "from an oil painting life size by A. E. Clabburn"; I am endeavouring to discover whether or not this portrait still exists. In 2015 I was contacted by an antique dealer, who had come into posession of an oil-on-canvas portrait, signed by Clabburn, showing a Roman Catholic cantor priest; this was subsequently purchased by my cousins Linda (née Adamson) and Nicholas Payne, who had it restored in 2018 (right). I have not as yet been able to identify the sitter. 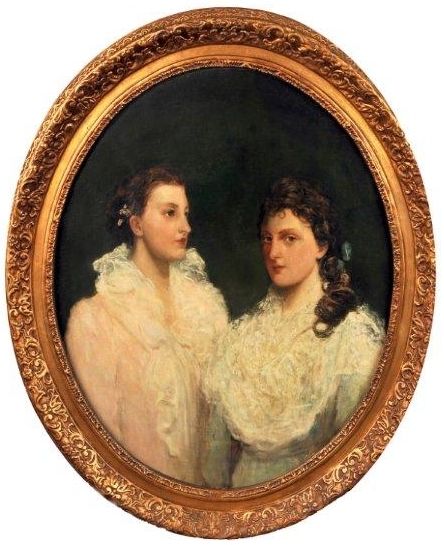 His descendants possess three of his pictures - the portrait of his wife, shown above (held by my cousin Rosetta Plummer, née James), a crayon drawing of his sister Lucy Clabburn (held by my sister Anne Barnard) and an oil-on-canvas portrait of his eldest two daughters, painted shortly before his death (which hangs above the fireplace at my home) - a high-resolution version can be downloaded by clicking on the image to the left. In the family's oral tradition there are (possibly apocryphal, and no doubt embroidered) stories of midnight flits from one house to another, when the rent could not be paid, and great generosity to friends and neighbours when money was suddenly plentiful. A family saying that has been perpetuated though the descendants of more than one of their children is "it's only money". The census records show them at a variety of addresses in Kent and south London, but in 1901 disaster struck and Arthur was diagnosed with stomach cancer; he died on 17 November that year, aged only 52, at 108 Sarsfeld Road in Balham, south London. Rosey was left with no income and with six children, ranging from Ethel, the eldest (22), though Charles (20), Adèle (16), Walter (12), and Dorothy (9) down to Viva (6). Family tradition is that Rosey had something of a drink problem, and had difficulty in coping with the responsibilities of single motherhood. It therefore fell to Ethel to take on much of the burden of seeking support from their better-off relatives (this was before the days of the welfare state!) to assist in bringing up her younger siblings. 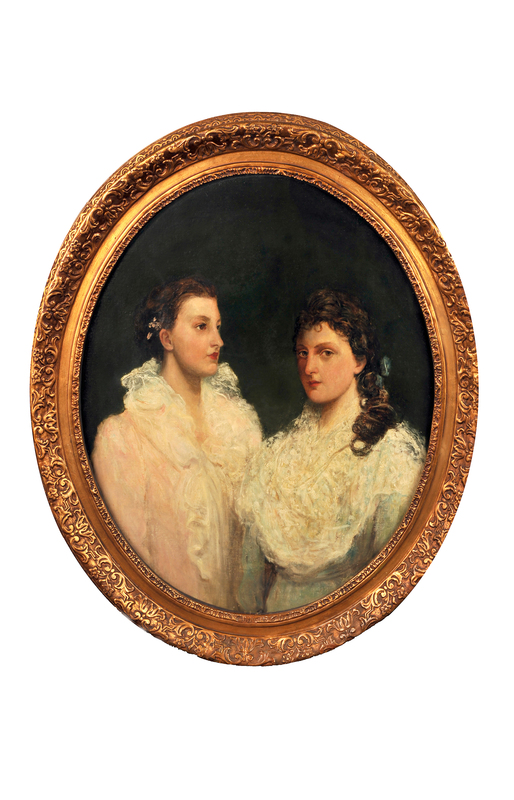 My mother (Ethel's daughter) told a story of how she managed to obtain some assistance from Edmund Meredith Crosse, of the well-known Crosse & Blackwell tinned food manufacturing firm, who was married to Arthur's sister Mary Louisa. Ethel de Pearsall Clabburn (12 Apr 1879 - 29 Feb 1960) took a job as Matron at Monmouth Grammar School, which no doubt brought in some much needed income. After a new Headmaster, Lionel ("Leo") James (1868-1948) took up his position in 1906, a slow-burning romance led to their marriage in 1912 and five children, including my mother. Charles Edward Stuart Clabburn (23 Jun 1881 - 6 Aug 1965) emigrated to New Zealand, where he became a successful businessman, initially importing the type of silk shawl his grandfather had made. He married Clara Hitchcock (9 Jul 1882 - 10 Feb 1966) and they adopted a daughter, Penelope. 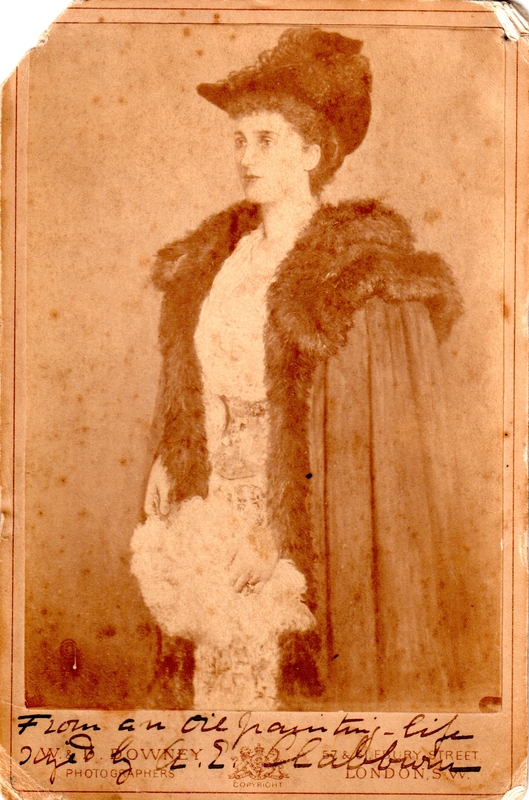 Adèle Vandeleur Clabburn (27 Dec 1884 - 7 Jun 1923) married a Scottish landowner, James Bertram Roberton (3 Nov 1879 - early 1940s) in London on 19 Jan 1907. James Roberton took his wife to Australia where he worked a farm property near Dalby in Queensland, later selling his estate in Scotland to an uncle. Walter Lionel Clabburn (10 Jan 1889 - 16 Aug 1951) went to join them in Australia in 1910, but the property failed following a prolonged drought, and Walter and the Robertons went their separate ways. Adèle died of cancer in 1923, leaving a son and two daughters, while James Roberton himself seems to have disappeared. Walter moved to Sydney and married Marjorie ("Madge") Camplin Sommerville (22 Aug 1890 - 4 Jul 1977) on 23 Dec 1914 and had five children. Dorothy de Pearsall Clabburn (30 Jan 1892 - 23 Apr 1970) married Cyril Hearne ("Billy") Pearson (14 Jul 1886 - 7 Feb 1946), an assistant master at Monmouth School, where her brother-in-law was the Headmaster. 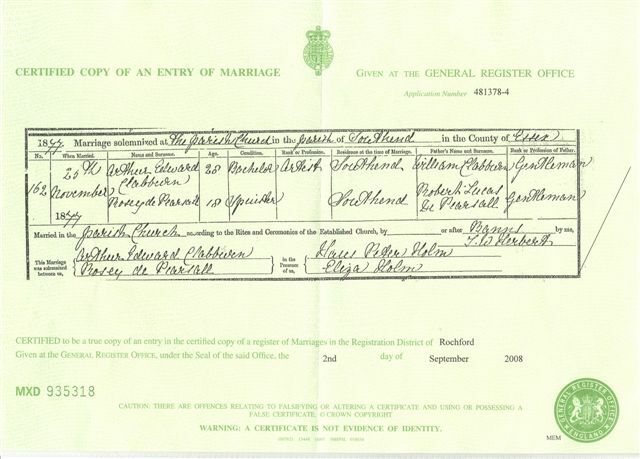 It is interesting to note that, though Dorothy and Billy attended the wedding of Ethel and Leo in 1912 as a couple, they did not marry themselves until four years later, on 8 Apr 1916; this possibly reflects the relative earnings of the two schoolmasters. They had three children, including the well-known character actor Richard Pearson (1918-2011). Viva Clabburn (10 Jan 1895 - circa 1933) spent some time with her brother Charles in New Zealand, before settling in the USA, where she married Charles Lawrence, and lived for a while in Chicago. She died, possibly shortly after giving birth, on 9 Oct 1933, to a daughter, Patricia. Most of the people shown are still living, and for reasons of personal privacy and to avoid the danger of identity theft, access to them is restricted to family members. A username and password are required to see them, and can be obtained by sending an e-mail to me (see contact details). Further information is given on the Family Trees index page.